A three day National meet and exposure program was held at Cochin Pastoral Orientation centre, Kerala. 40 participants from different parts of India participated in the program. Sr. Robancy the Program coordinator of CBCI Office for SC/BC inaugurated the program welcoming the participants and giving a brief about the National meet. Ms. Brinda Adige and Ms. Shalin Maria Lawrence were the resource persons. They spoke on Constitutional and human rights of Women, Ambedkarism and Periarism. The resource persons spoke from their personal experiences and the experience of many women. Mother Savitribai Phule award was given to the Dalit Christian women who contributed their great service to Dalits especially to Dalit Christians. 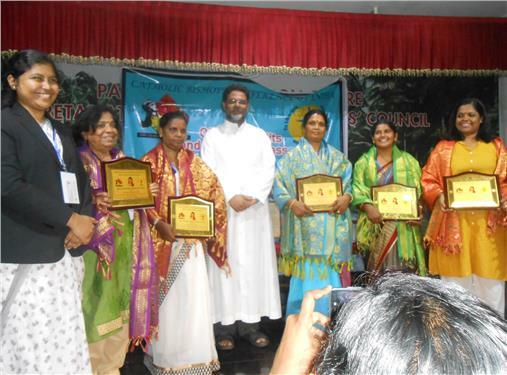 Ms. Jamuna from Odisha, Ms. Rani from Tamil Nadu, Dr. Isabella from Karnataka, Ms. Celine Joseph from Kerala and Ms. Jayanti Patole from Maharashtra received awards from Fr. Varghese, the Deputy Secretary of Kerala Catholic Bishops’ Conference, Fr. Shaj the Regional Secretary of Kerala SC/ST commission and Fr. Devasagayaraj, the National Secretary for the CBCI Office for SC/BC. All the participants were given certificate of participation. The general body meeting of Dalit Christian Women for Change (DCWC) was held under the leadership of its president Dr. Isabella. The members pledged to develop their knowledge and skills in their respective areas of interest. They also form chapters and units of DCWC in the regions and dioceses respectively. The members decided to asset their rightful space in the Church as well in the society.